In the figure above it can be seen in a painting by Gustav Hofmann from 1925. 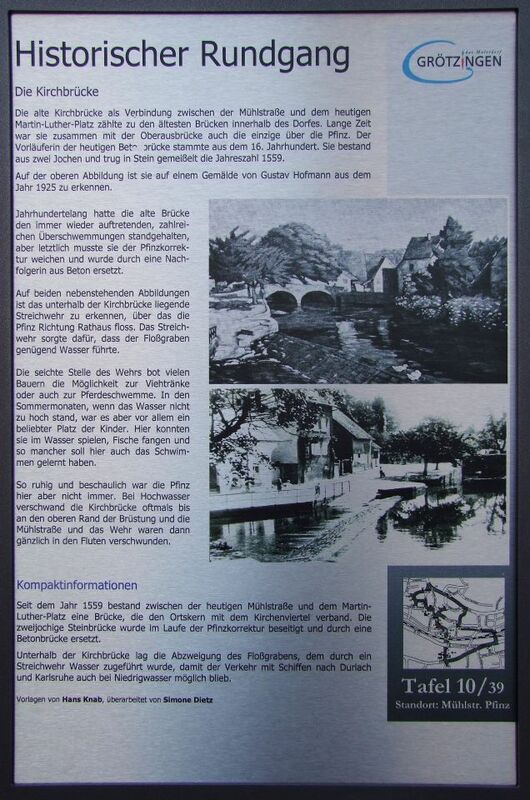 For centuries, the old bridge had to repeatedly occur, numerous floods stood up, but ultimately they had to give the Pfinzkorrektur and was replaced by a successor of concrete. In both illustrations alongside the weir located below the church bridge can be seen on the the Pfinz flowed towards the town hall. The spillway made ? ?sure that the Floßgraben led enough water. The shallow end of the weir offered many farmers the opportunity to livestock watering or even the horse-pond. In the summer months, when the water was not too high, but it was especially a favorite place of children. Here they could play in the water, catch fish and so many will also find the swimming've learned. So quiet and peaceful the Pfinz was here but not always. At high tide the Kirchbrücke disappeared often up to the top of the parapet and the Mill Road and the weir were then completely disappeared in the floods.